A Horse Named Kat by Lucy S. Lauer is a novel aimed at ages 9 through 14, but it has life lessons for all ages. Lauer will be at the Meet the Authors Book Fair at the Eau Gallie Civic Center on Saturday (11/20) and Sunday (11/21) from 10 to 5 during the ArtWorks Festival. Be sure to stop by to meet her and to see her book. 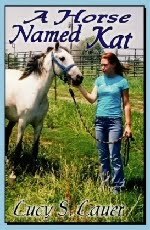 A Horse Named Kat tells the story of twelve-year-old Erin who gets her first horse after her dad leaves the family. It recounts Erin's struggles to regain confidence through riding and competing in western horse shows. 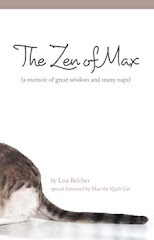 Through this book, Lauer not only engages the reader in an interesting story, but she deals adeptly with the deep feelings of insecurity and avoidance that many youth (and many of us) face throughout life. In addition, the book reinforces responsibility through Erin's devotion to taking care of Kat while it entertains the reader with exciting details of bare-back riding barrel and flag racing, and pole bending. Lauer says, "A Horse Named Kat is about horses, friends, family and fitting in." I highly recommend this book for the intended age group and beyond. It is a warm, engaging story. Lauer has developed a diverse and interesting group of characters in such as way that you want to find out the outcome for each of them. The story will quickly capture your attention, and you just might imagine yourself in a scene or two. Lucy Lauer has published poetry, short stories and memoirs, health and fitness articles and a children’s cookbook. Her work has appeared in Pot Pori, Kansas City Parent, Kansas City Star Magazine, Kansas City Voices, and the anthologies, Season of Light, and Horse Crazy. A Horse Named Kat is Lauer's first novel. She is a Licensed Mental Health Counselor who has worked with adolescents and families on many coming of age issues. She has two grown children and lives with her husband in Melbourne Beach, Florida. A Horse Named Kat (Cave Hollow Press, 2006) was awarded runner up in Juvenile Fiction by the Missouri Writers Guild in 2007. As a licensed mental health counselor, Lauer is fascinated by human relations and the individual ways people tackle their problems. She enjoys visiting middle schools and helping students find the emotional truth in their own writing. Lauer is currently working on a series of short stories with a recurring central character. For more information or to purchase a copy of the book, go to Cave Hollow Press. Enjoyed your review. This sounds like a great book for tweens. I'll have to check on this one for one of my cousins. She's 12 and loves horses.